Own Your Own Cult Classic - Beach Beast! Long ago, and oh so far away .... Monster from the sea visits mind-bending terror upon unsuspecting tourist couple and others. 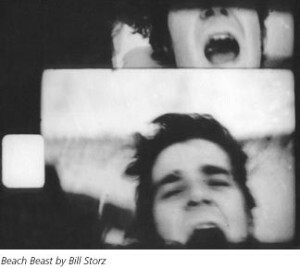 Beach Beast rips through the sands of Cape Cod and the american avante garde, 'B' and home movie traditions. Filmed entirely within the confines of the Commonwealth of Massachusetts... in Semi-Synch! Starring: Bob Schmitz and M. Lisa Phipps; Featuring: Sam Durant, Luther Price, Mimi Lipson, Andrew Fairbank, Tom Rhoads, Bill Storz, George Fueschel, Thea Weiss, Heather Thibodeau, San Shoppell, Thomas Stenquist and others. Note: Available on Vintage VHS. Shipping: Free to addresses in the United States. * What's an AHOB Member Item? Generous members of our community donate things that we can sell to help support Tucker and his Permanent Record work! If you have an item to donate, please contact Lindsay Mofford at deadmanschest@tuckerstilley.com! Thanks!!! Everything on this site can (and should) be purchased as gifts to other people. We'll be glad to send it directly to them or to you and you can deliver it.